+ What does a Greenery™ grow? One Freight Farms Greenery is capable of growing lettuces, leafy greens, herbs, brassicas, certain root vegetables, edible flowers, and many other crops in any location, regardless of exterior climate. To date Freight Farms has experimented internally with over 300 different crop varieties. Beyond that, one of the key innovations of the Greenery is its flexible main growing area, with aisles that can physically move to accommodate larger or smaller crops that cannot be grown in other container farms. + How much does a Greenery cost? A Freight Farms Greenery costs $104,000 (prices vary for international orders). Also consider the shipping fee, which varies based on your installation’s distance from Boston. Total start-up costs will range from $105,000 to $110,000 for a new Greenery-based business. + What is the Greenery's return on investment (ROI)? There’s no simple answer to this, and the success of your farm will depend on important factors like the demand for certain produce varieties in your area, the cost of electricity at your site, the distribution model you choose to adopt, and many more. Our business development representatives are on hand to help ensure your installation will be commercially viable before moving ahead, but no new venture is certain to succeed. With all that being said, farmers that follow our best practices typically realize complete return of their initial investment in three years or less. We do not. Freight Farms is exclusively an equipment sales company and service provider. + What is Grown by Freight Farms? Grown by Freight Farms is an on-site, fully managed farming service, wherein your organization gets a farm, gets a farmer, and gets to keep the produce. For organizations or companies that love the idea of serving beyond-local food, but prefer not to staff and manage a Greenery on their own, we offer this program. + What does farmhand cost? A standard farmhand subscription costs $1,200 per year for one user and one farm, and includes the farmhand Connect app for iOS. Farmhand Connect is also available as a standalone subscription for $10 per month, but is feature-limited compared to farmhand. Click here for a complete farmhand pricing breakdown. + Can farmhand detect problems with my farm? It sure can! Farmhand will send you notifications if it detects internal climate conditions falling outside of your targets. With your permission, farmhand can also transmit data to support staff here at Freight Farms. That way, if something goes wrong and you need to call us, we’ll know exactly what’s wrong and how to help. + How does Freight Farms support its customers? Freight Farms has a dedicated support team called Client Services. They’re with you from the moment you purchase a farm and will help guide you through training, delivery, installation, launch, first harvest and beyond! Click here to learn all about Client Services. + Does Freight Farms provide training to new farmers? Yes, we do. We have two standard options: an in-person Farm Camp in Boston and an online training course called farmhand® Academy. Get all the details in our Training Booklet. + What is Freight Farms? Freight Farms is a global leader of the AgTech industry. As the creator of the ‘container farm’, Freight Farms’ suite of products–Greenery, farmhand®, Grown by Freight Farms–aims to bring everyone access to sustainable and local food by creating an interconnected network of farms and farmers that empowers anyone to grow food for their community. + What’s the history of Freight Farms? You can learn all about Freight Farms’ origins and the major milestones we’ve achieved on our Company page. + Where is Freight Farms headquartered? Freight Farms is located at 44 Plympton Street in the South End neighborhood of Boston, MA. Hydroponics is the method we use to grow inside the Greenery. Hydroponics is an alternative farming method that grows plants without the use of soil. Instead, plants’ roots are submerged in nutrient-rich water that provides the plants with all the nourishment they need. You can learn all about hydroponics and the different types of systems–including the ones used in our farms–in Hydroponics 101. + Who are Freight Farms’ customers? Our customers include business owners, soil farmers, corporations, schools and universities, municipalities, non-profits, and more! + Where are Freight Farms operating? As of March 2019, we have over 200 farms located in 38 U.S. states and 15 countries. + What are the applications of Freight Farms’ technology? Inspiring individuals to start their own business, like Corner Stalk Farm in Boston. Creating meaningful workplace amenities with Grown by Freight Farms. Giving students access to local and nutritious foods, like Clark University and Sodexo in Massachusetts. Launching an urban farming venture, like Square Roots in Brooklyn. Therapy and meaningful employment to help veterans re-assimilate, like OD Greens in Ohio. Creating for-profit sectors that allow non-profits to expand their offerings. Bringing food security to their island homes, like Bees Greens Co. in Hawaii. And that’s just the short list. Get more inspiration when you check out our Case Studies. + What is the Greenery? The Greenery is a commercial-scale, vertical, hydroponic farm built inside an intermodal freight container. + What does it grow? One Greenery is capable of growing lettuces, leafy greens, herbs, brassicas, certain root vegetables, edible flowers, and many other crops in any location, regardless of exterior climate. To date Freight Farms has experimented internally with over 300 different crop varieties. + What is the electrical draw? Total power consumption for a Greenery under full load is 180 kWh per day. + Where can I put one? Aside from connection to utilities, Greenery installation requires only a level 50 x 10 ft. parcel sturdy enough to withstand its 8-ton gross weight (pavement, concrete, trap rock, and sonotubes are all adequate). Greenerys are retrofitted from new international, intermodal freight containers and are therefore literally designed to travel. + Can I grow in extreme hot or cold climates? Yes to both! The Greenery carries a U.S. Department of Energy insulation rating of R28, and we have farmers operating in climates as cold as -40°F and as hot as 120°F. + Where do I get my supplies? farmhand® Shop makes it simple to replenish supplies. Here you can purchase all of your growing essentials — fertilizer, nutrients, seeds — all delivered directly to your door. We've aggregated top brands in the hydroponic industry to make shopping for your supplies quick and easy. But you’re not locked into farmhand Shop: It’s fine to purchase supplies from any vendor you choose. + Can I operate a Greenery as a business? For many of our customers, that’s the whole point! A single Greenery is capable of growing a commercially viable amount of food year-round, regardless of weather or climate. Our business development representatives can help you design a model that makes sense for your region and marketplace. Please contact us for personalized recommendations. + Are the farms compatible with solar panels? It's possible, yes! While we do not offer a pre-installed solar package, some freight farmers choose to power their units with solar energy. + How do I know if Grown by Freight Farms is right for my organization? Grown has potential applications for medium and large office parks, residences, hospitals, restaurants, colleges, non-profits, and more. Grown is best for organizations that would benefit first from a supply of beyond-local produce, but also recognize the intangible benefits of a cutting-edge, sustainable, and safe farming module right there on the premises. Please contact us to discuss your installation idea. + What is included in the service? Grown subscribers will enjoy a Freight Farms Greenery, installed at a location of their choosing, as well as all the produce farmed inside it. Freight Farms will employ a hydroponic farmer to do all the farming on your behalf, maintain and restock the Greenery, and deliver the produce to you. + What can I do with the food? We offer two preconfigured programs that we call Grown to Supply (which supplies your on-site cafeteria or salad bar with fresh produce) and Grown to Share (which creates a CSA farm share program for your people). But if neither of those sounds quite right, it’s easy to design a custom program to meet your specific needs. + How much does Grown by Freight Farms cost? + Where is Grown by Freight Farms available? The service is currently rolling out to New England locations, with national availability coming soon. Installation site requirements are the same as the Greenery itself: We’ll need access to electricity, WiFi, and water (even a garden hose is fine). There’s no harm in reaching out, please click here to talk with us about Grown. farmhand is a cloud-based farm management and automation software suite, developed by Freight Farms and intended for all hydroponic growers. In-farm sensors detect conditions like pH, ambient temperatures, humidity, nutrient levels, and more, all of which can be viewed and controlled from a smartphone or desktop app. It’s even possible to connect an in-farm webcam to keep an eye on your operation from afar. All Freight Farms container farms are compatible with farmhand, allowing farmers to handle every aspect of their operation—other than the farm work itself—remotely. + Is farmhand for Greenery farms only? No, farmhand is compatible with many hydroponic timing and automation systems. Many farmhand users do not own any Freight Farms products other than the farmhand software itself. + How else is farmhand useful? Farmhand also makes an excellent training tool. Within the desktop application, users can purchase the “farmhand Academy” add-on, which is comprehensive for operating and maintaining our farms. It features over 120 lessons and 10 distinct learning paths, with progress tracking and certifications within the app. This add-on carries a one-time fee of $600. + Is there a cost associated with Client Services? Our Client Services team is a free resource for all customers that purchase container farms from us directly. You can reach them through farmhand, by phone, or via email. + Is the Client Services team available 24/7? You can reach Client Services Monday-Friday 9am-6pm EST. If you would like to contact them outside of these hours, please schedule a call. Our Knowledge Base, an online repository of Freight Farms information, is available 24 hours a day. Yes, we do. We have two standard options: an in-person Farm Camp in Boston, and an online training course called farmhand® Academy. Get all the details in our Training Booklet. + What other resources are available to me? 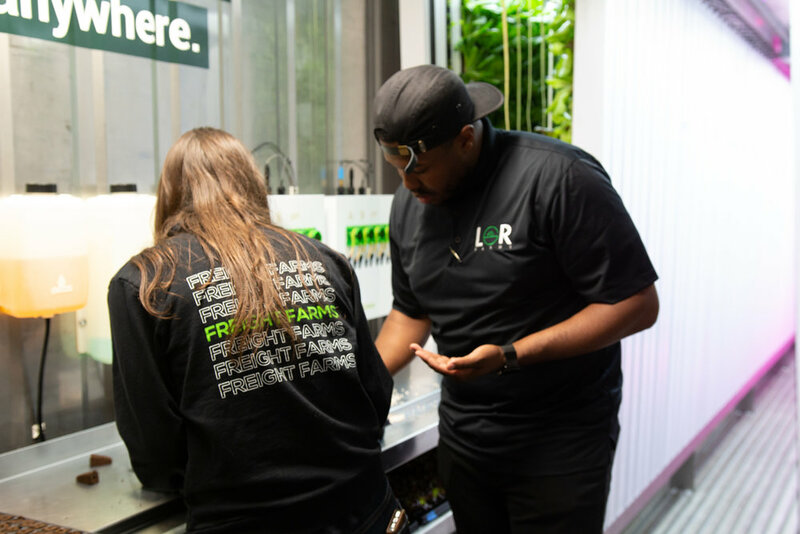 In addition to our full-time support team and robust training programs, farmers have access to the Freight Farms Knowledge Base, which contains hundreds of articles and videos on a range of topics, from best business practices, to recalibrating the farm’s sensors. We also have a Freight Farmer Forum that you can access as soon as you purchase. Connect with fellow Freight Farmers to share knowledge, get help troubleshooting, and share tips and tricks for finding new customers.